In my industrial-punk-with-airships setting, I think it would be cool to have ship-mounted and personal-use ranged weapons that shoot swords, axes, glaives, or other heavy melee weapons. I'd like this to be the kind of weapon that uses chemical energy rather than mechanical energy to fire, or at least doesn't need to be cocked by hand. Ergo, I think I'm looking for something like a gun that shoots swords. The weapon must be able to accurately launch a bladed weapon weighing roughly 5 pounds at a distance of 500 feet. Longer range, higher weight, and the ability to shoot multiple blades at once is better. The weapon must not require muscle power to fire. It's fine if it has to be manually reloaded, but no manual-crank-powered spring energy. The weapon should be small enough that several can fit on a sailing ship. No more than 2-3 times the size of a cannon. The weapon shouldn't use technology that couldn't be invented in an 1800s-era society. It's fine if it uses techniques or science that weren't known yet, as long as all the parts and materials were available at the time. It's fine if the weapon can only fire certain kinds of melee weapons, including ones built specifically for this purpose. The only hard requirement for what kind of weapon that it shoots is that, immediately after being fired (assuming the melee weapon isn't damaged in the process), the melee weapon can be picked up and used as a regular, effective melee weapon. For bonus points, I'd like to see a version that can be shrunk down far enough to be used as a personal defense weapon. It's fine if it's impractical, as long as it can be held and fired by a single person, and can accurately fire a blade up to 30 feet or so. This is not intended to be an effective weapon for a realistic military with a sane doctrine. This is intended to be more like a vanity weapon used to show off the designer's engineering skill, and the hubris of a combatant willing to use such an impractical weapon. I'd love it if the weapon met the basic requirements here, but "effective weapon for a real conflict" is not a requirement. For propulsion, it's hard to beat explosives. You probably don't want to explode the actual weapon, so maybe you want a sealed-cylinder system. For instance, there are Russian pistols which shoot the SP-4 cartridge, which has an internal piston. The gunpowder explodes, and pushes the piston forward to launch the bullet, then the piston stops at the end of the cartridge - this stops any of the propellant gas escaping, making the round much quieter and eliminating any muzzle flash. 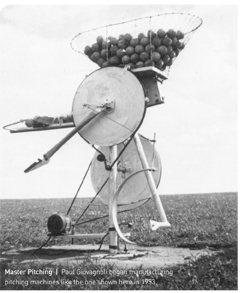 For a much more 1800s-crazy version of this, Thomas Edison tested several variants on an early helicopter using an internal combustion engine powered by explosive guncotton! 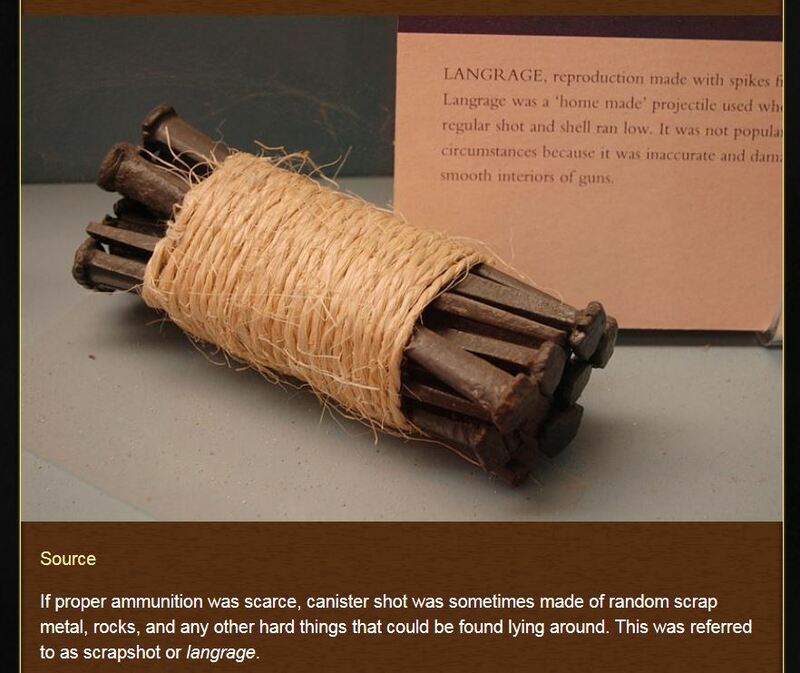 So let's say you have a system where you pile some guncotton (invented 1865), cordite (1889) or even black powder into a large piston, seal it up, then ignite it. You'd probably want some sort of complicated sealed ignition system to preserve cylinder pressure. Spark plugs were invented in 1839, so you could use one of those. Or use a percussion cap (1800), where the cap's body seals off the chamber. Propellant gases would push the piston forward, then you'd have some vents in the wall of the cylinder which were only exposed at the end of the stroke, allowing any remaining burning gas to vent. Or, as an alternative, you could use a giant steam cylinder like an aircraft carrier catapult. You could even use a steam engine to rotate a large flywheel, then use a clutch to tap off all that power to accelerate something from stationary to very fast in a short time. But steam is a lot less portable and needs much more time to warm up. So now you have propulsion. At this point, you could attach the piston to whatever you wanted! Maybe you have a steam system to hurl your weaponry, and you tap a little bit of the steam to power a rotating wheel, attached to a sled, attached to the steam launcher. You load the wheel with a double-headed axe, specially weighted with a heavy pommel so that the center of mass is somewhere slightly towards the bottom of the handle. The wheel spins the axe at a terrifying speed until you trigger the launcher, which sends the sled, wheel and axe flying forward. When it hits the end of its travel, a lever on the sled pulls the wheel away from the axe, sending it flying unpredictably onto the battlefield. Or maybe you want to have something smaller, more like the size of a medium mortar. At this point you probably want to ditch the piston idea, and just push a single item of weaponry directly. At this scale, swords, knives, or maces are probably the most practical items to fling. Surround your weapon in a sabot - nowadays we'd use plastic, but a light wood like balsa would work, or even cardboard - so that it's the same diameter as the barrel. Put a large explosive charge behind it, then stick the end of the mortar into the ground and fire. Modern mortars can fling a 3.2-inch 10lb projectile up to 16,000 feet, so mass shouldn't be too much of an issue, although aerodynamics would probably reduce the range rather severely. The problem with a mortar is that you can only fire it indirectly, as you need to have the end in the ground to deal with the not inconsiderable recoil. (Assuming you don't hold it against a tree or a large rock.) If you want your sword-mortar to be capable of direct fire, you probably either want it to be used by really, really strong fantasy beings, or you want a recoilless system. The latter would look spectacular: you'd have to fire enough propellant or reaction mass out of the back to balance your 5lb weapon coming out the front. Let's hope there's nobody standing within a few hundred feet behind you. Having said all of the above, of course, since rockets have been around since China a thousand years ago, you could just tie rockets to your weapons! Let's talk about the actual weapons, too. Most weaponry is designed to be used for a long time, and carefully taken care of outside battle. It's heavy, it's designed to be comfortable in the hand, and it's not particularly going to like being flung 500 feet onto a stony battlefield. But if you're in the 1800s, you've got access to production-line metalworking technology - steam- or water-powered die forging and stamping presses, sharpening wheels, etc. I could see your weaponry being more rough-and-ready - designed to be manufactured en masse, flung once, picked up and used once, then discarded. Think a sword which is just a long blade, with a rudimentary knurled metal handle and a guard which sticks out only an inch to either side, and which doubles as stabilising fins. Or an axe along the same vein: two broad heads with the middles stamped out to save weight, and a spike on both ends so that it can hit end-on and still do damage. All in all, I thoroughly enjoy this idea. So, you basically want a Harpoon Canon. A harpoon cannon is a whaling implement developed in the late 19th century and most used in the 20th century. It would be mounted on the bow of a whale catcher, where it could be easily aimed with a wide field of view at the target. Powered by black powder and later, smokeless powder, it would generally fire a large steel harpoon, either solid steel (cold harpoon) or fitted with an exploding black powder, or later, penthrite (PETN) grenade. Just explain that the canon is made to fit whatever weapon you want to shoot. And don't spears count as melee weapons ? It would make everything easier. Cool it may be, and to a degree you can do it, but it's a hair unrealistic. Might make good Manga, though. OK, for the record, bullets are cheap. So are arrows, bolts, spears, javelins, and just about anything else that's designed to fly through the air without spinning. Launchers for such objects are, for the most part, also cheap. Please keep this in mind. Yeah, it may be cool — but if you're ever forced to defend the decision, it'll be unlikely that you can justify it. Having said that, allow me to introduce you to the over-hand lever-action baseball launcher (image courtesy ingrams.com). Now, there are reasons 99.9% of the pitching machines aren't made this way anymore. That's because baseballs, like bullets, arrows, etc., can be launched more efficiently in almost any way but this one. Why it was the first type of pitching machine to be built is beyond me. Unless the designers just couldn't get the image of a pitcher's arm out of their heads. Nevertheless... now you need to think "throwing knives." Image courtesy GettyImages.com. And I'm convinced the hat makes a difference. the goal here is to throw the weapon with an intentional spin (in the hope of some accuracy). 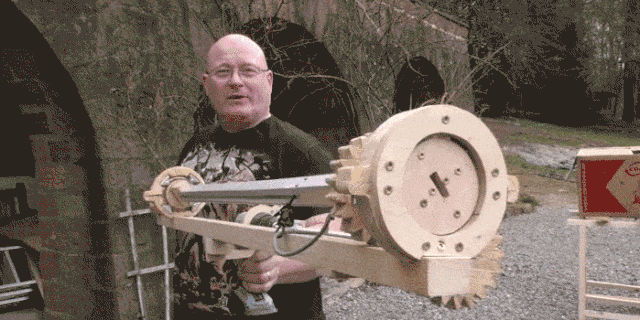 So, what you're building is an automatic knife-throwing machine that happens to have fittings for swords, axes, etc. It'll take a ton of energy to give it any distance, you'll be constantly maintaining and repairing the overly complex solution, your aim outside of, oh, 25 feet will stink magnificently, but the sight of having sword after sword thrown at you would scare the snot out of me. Throw them fast enough and I won't have time to pick up a souvenir. And Agrajag and VLAZ are absolutely right... as cool as this may be, what you're really doing is arming your enemy. Remember, bullets, arrows, etc.... are cheap. Oh, bonus points... No can do on the machine shrinky. Newton's third law (equal and opposite reaction...) makes this idea a non-starter. You need a machine that can provide all the force and leverage necessary to launch the weapon. Most of us can't do that with a single sword or battle axe with our own hands (it looks cool, have you ever actually tried it? the idea makes my wrists ache) — much less with a machine strapped to our arms. So, you'll be towing your personal machine (see image above) behind you. This concept is extremely silly. It wouldn't work in any RPG setting remotely serious. That said, I love silly stuff. So let me chime in with my own ridiculous invention. A small, water-stained paper flyer finds its way to your hands. There is a strange, spiked cannon-like contraption on it that looks like the unholy cross between a mortar and a cover for a heavy metal album depicted on it. By its side, there is a medieval-looking flail depicted with a rather large spiked steel ball and a single, smooth cannonball. Are you tired of the logistics needed to supply your troops with melee weapons while they are in the middle of a heated battle? Are you fed up with those complaints about the poor quality of the equipment you're providing to your grunts? Are your ACME swords always breaking? The Advanced Flailmaster Pro 3000™ by NotMad Industrial™ uses the incredible power of BLACK POWDER and SPRINGS to deliver a very dangerous load on the heads of your enemies and quality usable weaponry for your troops! Its special cannonballs are actually a very smart, spring powered device that unfolds itself into a heavy spiked flail upon launch. The spikes, chain and handle are held inside the shell of the cannonball by a delicate set of glass switches and powerful springs. With the power of the launch from the cannon body, the switches break, releasing the spikes and deploying the handle mid-air. When the weapon lands it inflicts not only heavy damage from the heavy iron object falling from the sky but also provides your army with bashing weapons to continue the fight. *Not actually guaranteed to work against barbarian lawless hordes and murderhobo adventurers. Or lawyers. Or, anyone, really. Just don't rely on this. Ok, so first you design the ammo. Easiest would be to make something like ballistic knife. It's not only great projectile on it's own (because even if it won't open it's still a bullet) BUT the spring give it flexibility (try to drop a regular knife from 30 feet and see if it usable) needed for later use. 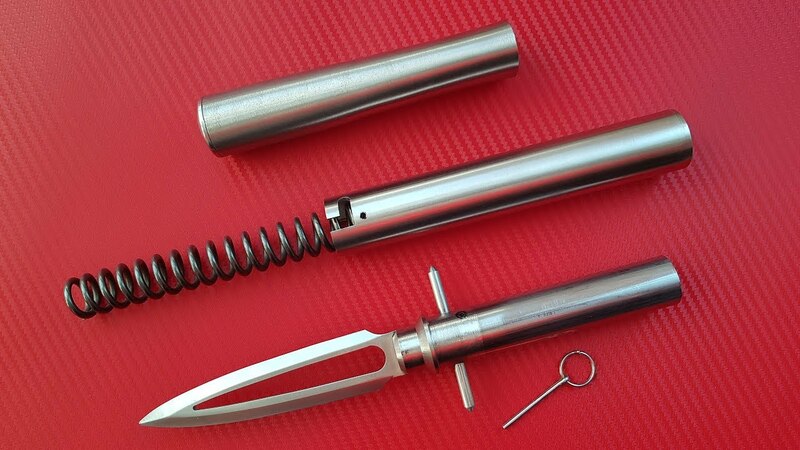 The point of a ballistic knife is to LAUNCH a blade from the barrel. You can modify it so if won't open it can still be picked up and spring can be released manually. How do you launch it? Pneumatic cannon. You have ship, you have steam, you have energy that can be used. Potato launcher but you change the potato with a cylinder that have blade hidden inside. (which can be used as a personal weapon but it's counter productive AS you have weapons on you already in the form of the knifes). Early bayonet. Simple as that. Just don't even bother solving the "being able to shoot without removing bayonet" problem. This fit down the barrel of the musket. Which means you could not fire the gun with the bayonet attached. This was a big pain on the battlefield, because you had to make the "gun to bayonet" transition while the enemy was charging at your line. If you got all fumble fingers, you could find yourself holding a discharged gun and a weird dagger. They were in a big hurry to fix that. We're not, we're gonna use it. The deal with these things is you load a "blank" round into the rifle (full propellant charge, no bullet) and the propellant launches the grenade. That's a rather straightforward operation for a muzzle-loading musket; just don't load the bullet. Although if we are already using shells, you can simply use a "bullet trap" aka "shoot-through" grenade launcher which adds the bullet to the kinetic energy of the launcher. Those are prevalent today and not technologically difficult. So instead of the grenade, we shoot the dagger. Just like that. Final answer! A spear/harpoon gun would be my first choice. It fits the projectile weight and range requirements and appears to also be a viable infantry weapon, if maybe a little clunky. I'd advise against firing multiple projectiles, the cost in complexity and accuracy is just too high at your tech level. However, modifications that allow for a faster reload, e.g. with a "magazine" of spears and pre-packaged powder charges, seem feasible. A glaive is essentially a fancy spear and should work just as well, as long as you don't make it too top heavy. I can't see a way of making axes work, but flechette-like swords or kinves with a well designed sabot might be within the ability of your engineers and work more or less the same way. Last but not least, if you're going after personnel, sails or other "soft" targets: Shrapnel was invented in the late 1700s, and grapeshot/canister shot were known before that. A bundle of short, broad knives might serve this purpose reasonably well, although there'll always have to be a compromise between their usefulness as a projectile vs. as a melee weapon. This might be your only viable option if you want to fire multiple weapons at once. This link is about a hobbyist who created a pump action slingshot that fires spinning throwing knives. It isn't all that accurate and the knives then to tumble, but it's intimidating. I don’t know why everyone is overthinking this. You specified that you don’t want it to be more than two times the size of a cannon, so just use a cannon. It’s trivial to make a 12 inch cannon with the tech level you have specified, and that is more than enough bore diameter to fit any practical melee weapon. Once you have the cannon, prepare specialized sabots for whatever you want to shoot. If airships are fighting, shrapnel shot is already gonna be popular and effective, so instead of a lightweight sabot designed to drop away, build it out of frangible matetial. At this point, you actually have a relatively practical weapon. The presence of a melee weapon among the shrapnel is not necessarily detrimental, even if it isn’t beneficial, and while it increases the cost of each projectile, it won’t be by a ludicrous amount. Fire them in the sheath with the hilt projecting from the gun barrel. On firing, the sheath is pushed out of the barrel by the usual cotton wad. The sword and sheath turn in mid-air because of the extra drag on the hilt. The air resistance on the hilt slows the sword slightly and unsheathes it like a two-stage rocket. The sheath flies ahead spinning wildly and causing chaotic injuries, immediately followed by the blade flying like an arrow towards the target. In this image, spikes are standing in for swords. Load cannon with powder. Load wadding. Wrap swords up in a cylinder. Cylinder should be smaller in diameter than cannon barrel. If diameter is bigger, wrap cylinder tighter. Place cylinder in cannon barrel. I take it that the use of Langrage shot was born of desperation. There is no reason a person willing to fire spikes would not just as easily fire swords if they were handy. I could totally see the gunners gathering up anything metal off of the many fallen soldiers around them, wrapping the haul up in some dead guy's pants, and shooting it. You can do it, but it's not going to be pretty. There are two problems: recoil and accuracy. Propelling a 5-lb projectile 200 yards has a major, easily-calculated cost:muzzle velocity. At a minimum (using about a 45 degree launch angle), you're talking about 44 m/sec. Just to indicate how difficult it would be to use, the maximum altitude of the projectile would be 50 meters and time of flight would be on the order of 7 seconds. If nothing else, targets could simply dodge it. If we go to something more reasonable (in terms of accuracy), you might accept a launch elevation of 10 degrees, and this will require a muzzle velocity of about 340 m/sec. This is just about pistol bullet velocity, with a projectile mass (3 kg or so) which is roughly 200 times that of a .45 caliber bullet. It's pretty much guaranteed to knock you off your feet and break your shoulder. So, you'll have to go to a shoulder-fired recoilless rifle similar to the old US 90 mm or the modern Carl Gustav. Both of which have a considerable back-blast zone which will kill your comrades if you're not very careful. I wouldn't want to try this with black powder propellants, but that doesn't mean it's actually impossible. Once you have launched your melee weapon, most of them will have horrendous accuracy, since they are not remotely stable aerodynamically. A sword, for instance, will have no stability at all, and will quickly tumble and go wildly astray. I'd guess that your best bet would be either a one-handed ball-and-chain flail (with a very short handle) or a set of nunchucks. These would behave in flight rather like chain shot. Accuracy is still bad, but the idea seems cool. There is a fundamental issue in your request. Humans are pretty puny and we have very poor natural offensive and defensive capabilities (no claws, soft skin, weak teeth). So, we developed armour to defend us, and weapons to augment our offensive attacks. Let's take the example of a human vs human. Without weapons humans have to punch, scratch, kick, and bite. If you add armour into the mix (any kind, chain mail, plate armour, kevlar, tree bark, leather, etc...) punching and kicking quickly becomes dangerous for the attacker (you don't want to punch chail mail, or those Gothic style suits of armour with all those nasty spikes). Also, some humans were better at fighting than others. So, humans made weapons that increased thir offensive abilities.. 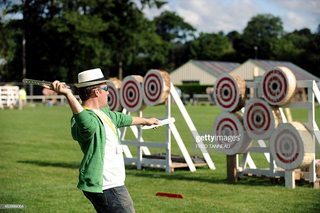 Clubs, knives, and swords are great but they are close range weapons and gave an advantage to martially more talented humans. Throwing knives at people doesn't work very well, especially if they're armoured. Axes, maces, and warhammers require much less finesse but greater strength, although you still have the issue of having to get super close to an enemy to attack them. Spears increased offensive range. Ranged weapons like arrows, ballistae, and such, changed the game forever. Now, if you really think about the development of weapons, especially ranged weapons, you have knives that became swords (in order to attack at a greater distance), which became spears (in order to attack at a greater distance), which became arrows (in order to attack at a greater distance). Eventually, arrows became cannonballs, since they deliver much greater energy to the target at a much further range, although those were hard to carry around and aim accurately, so they became bullets. Bullets are essentially a tiny version of arrows and arrows are essentially tiny knives that are really good at flying through the air. Now, why would you want to throw a weapon that is really good at close range? It would be like using a gun to chop up your salad veggies, or asking how to use a nuclear reactor to grill your meat. Yes, it's hot enough to cook, but it's incredibly silly to try to reduce the extremely high temperatures to one that wouldn't burn your steak to a crisp. Use the specially desisgned grill you bought at Home Depot instead! Similiarly, don't throw swords at people. Instead, throw the tiny swords commonly called "arrows" or "bullets". They are cheaper, lighter, more accurate, more reliable, and you won't have to bend over backwards to invent a new mechanic. P.S This does not necessarily accurately reflect te development of weapons in human history (sharp wooden stick, aka spears, were probably used before swords. This is just a theoretical exercise in weapon methodology. Not the answer you're looking for? Browse other questions tagged weapons kinetic-weapons or ask your own question. How advanced or effective weapons can be created from mostly animal body parts? What would be favoured weapons and weapon styles of a four-armed human? What would be the ideal melee weapon for someone with superhuman strength? How would weapons and armour be affected if metal weight was negligible? How would the rules for carry and use of weapons be affected by reliable stun guns? Advantages of an electrified sword? Could a non-newtonian armor coupled with a dampening fabric stop bullets but not melee weapons and arrows/bolts? How to make a rocket-boosted sledgehammer that won't break the users' arm?